I recently saw a ridiculously awesome movie, Bohemian Rhapsody. You know the story. It’s about the legendary rock band, Queen, and their late, great lead singer, Freddie Mercury. There’s a scene in this movie in which the band is developing the idea for their song, “We Will Rock You.” You know the song. They wanted to engage their audience. They wanted their fans to be part of that song. Watching that scene and listening to that song gave me a thought. As it was for Queen in playing that song, it is for all brand and businesses. You want to engage your audience. You want to involve them in whatever it is you do in some way, shape or form. 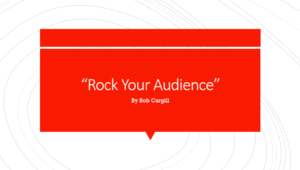 You want to rock your audience.